FIELD, ELIZABETH (Eliza) (Jones; Carey), author and painter; b. 1 June 1804 at Lambeth (now part of London), England, the eldest daughter of Charles Field, a wealthy soap and candle manufacturer, and Elizabeth Carter; m. first 8 Sept. 1833 Peter Jones [Kahkewaquonaby*] . secondly in 1858 John Carey of Muncey, Canada West; d. 17 Aug. 1890 at Brantford, Ont. Eliza Field, a member of an affluent family, “spent eight happy years” in a boarding-school in Surrey, England, where she exhibited a talent for painting. After her mother’s death in 1820 she returned home to assist in raising her six younger brothers and sisters. An intensely religious individual, she worshipped with her family at the evangelical Surrey Chapel and began teaching Sunday school there in 1823. Although she led a comfortable life, throughout her youth she felt “impatient” to do God’s work, and as she recorded in her diary on 2 July 1832, she wanted “to be more useful – to be more entirely employed for the benefit of others.” She had already met the man with whom she would undertake this endeavour. They took up residence in a small cabin on the Credit River Indian Reserve and Eliza’s first years proved extremely difficult. Wherever she went with her husband they aroused great curiosity and her diary entry for 6 Sept. 1834 suggests her distress: “I desire to be enabled to feel charity to such who from the want of education or refined delicacy towards the feelings of a stranger make me an object of general observation.” She also found it difficult to adjust from the luxury she had known in England to the hardships of life on an Indian reserve. A small woman, of delicate health, she frequently came down with fevers and between 1834 and 1836 she suffered two miscarriages and two still births. Nevertheless, she instructed the children on the reserve in Christianity and also taught the Indian girls sewing, a skill she had hastily acquired shortly before leaving Britain. Elizabeth visited England with her niece Catherine Bunch Sonego [Nahnebahwequay*] in 1837–38 and after her return gave birth to a son, the first of four who survived infancy. In 1841 Peter was posted to the Muncey mission (near London, Canada West) where they remained until 1849. Following a brief stay in London they moved into a substantial brick house, Echo Villa, in Brantford in 1851; Peter was to die there five years later. 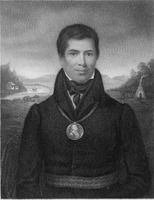 Although the 1840s and 1850s were marked by Peter’s severe illnesses as well as by the rejection on the part of some Ojibwas, led by Oominewahjeween (William Herchmer), of the Joneses’ efforts to “Europeanize” the Indians and create “brown Englishmen,” they were the years of greatest domestic happiness for the growing family. During this time Eliza also pursued artistic and literary interests. In 1838 she published a Memoir of Elizabeth Jones, a little Indian girl, an account of the death of her pious niece, which was intended as a lesson for use in Sunday schools. She continued her painting and sketching, and won a prize at the Upper Canada Provincial Exhibition in 1854 for her miniature water-colours. After Peter’s death she gathered together his diaries and an unfinished history of the Ojibwa; Life and journals appeared in 1860 and History of the Ojebway Indians appeared in 1861. 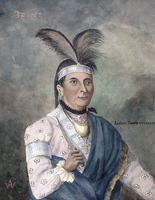 She later wrote a sketch of Joseph Brant [Thayendanegea*], which ran serially in the New Dominion Monthly late in 1872, under her Ojibwa name Kecheahgahmequa (the lady from beyond the blue waters). Her diaries for various periods between 1829 and 1883 have been preserved, and offer, among other things, an opportunity to study her comments on Upper Canada as well as her impressions of her husband’s people. In 1858 Eliza had married John Carey, a white farmer from New York who had been the school teacher on the Muncey Reserve during the 1820s. The marriage was unhappy and Eliza may have left her second husband within several years. In one of her notebooks she recorded “my own tastes, & feelings & sympathies, were not and never could be in union with my husbands”; Carey did not have Peter’s “natural refinement & amiable qualities.” Continuing to make trips to England, she taught painting in Brantford, in addition to her writing, before she lost her sight about 1880. The last years of her life were spent in Lambeth Cottage, her home in Brantford, where she died on 17 Aug. 1890. She deserves to be remembered today for defying the social pressures against an inter-racial marriage and marrying the man she loved. Elizabeth Field was the author of Memoir of Elizabeth Jones, a little Indian girl, who lived at the River-Credit Mission, Upper Canada . 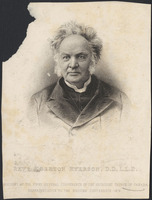 . . (London, 1838; rev. ed., New York, 1841), and, as Ke-che-ah-gah-me-qua, “Sketch of the life of Captain Joseph Brant, Thayendanagea,” New Dominion Monthly (Montreal), July–December 1872: 198–203, 276–82. She was also the author of “Brant’s school-days,” New Dominion Monthly, July–December 1872: 349–51. Victoria Univ. Library (Toronto), Peter Jones coll., Eliza Jones Carey papers. Peter Jones (Kahkewaquonaby), History of the Ojebway Indians; with especial reference to their conversion to Christianity . . . , [ed. Elizabeth Field] (London, 1861). [Kahkewaquonaby], Life and journals of Kah-ke-wa-quo-nā-by (Rev. Peter Jones), Wesleyan missionary, [ed. Elizabeth Field] (Toronto, 1860). Christian Guardian, 5 Nov. 1890. D. B. Smith, “Eliza and the Reverend Peter Jones,” Beaver, outfit 308 (autumn 1977): 40–46; “Peter and Eliza Jones: their last years,” Beaver, outfit 308 (winter 1977): 16–23; “The transatlantic courtship of the Reverend Peter Jones,” Beaver, outfit 308 (summer 1977): 4–13. Donald B. Smith, “FIELD, ELIZABETH,” in Dictionary of Canadian Biography, vol. 11, University of Toronto/Université Laval, 2003–, accessed April 24, 2019, http://www.biographi.ca/en/bio/field_elizabeth_11E.html.